We have commercial roofing down to a science. Literally. From concrete repairs to gas island restorations, to industrial and decorative floor coatings, Simon Surfaces is your trusted resource for all of your concrete problems. In our years of experience, we’ve found that most surface damage on concrete – even when severe –can be repaired or restored instead of being torn out and completely replaced. We go to great lengths to understand your specific situation and business needs so we can effectively assess which one of our solutions will work best for you. WE ALWAYS HAVE YOU COVERED ANYTIME. ANYWHERE. Simon Roofing’s ISO-certified Customer Service Center is standing ready to handle all of your roof leak requests, 24/7/365. Just one call, email or fax to our Service Center will get you the service you need. 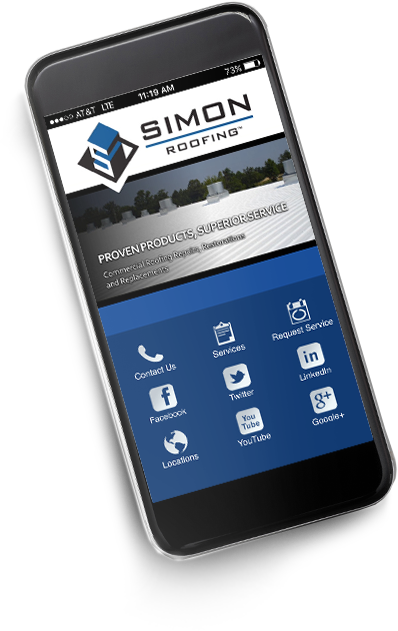 Or you can download our Simon Roofing app and request service with a simple click!